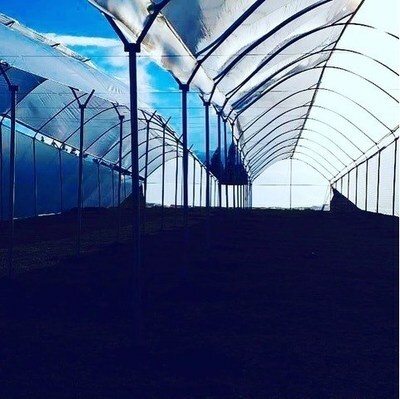 Cannabis producer FoliuMed has completed the construction of its first greenhouses on a 16 hectare grow site close to Bogota. In an area spanning 20 soccer fields, FoliuMed will produce over 70 tons of medicinal hemp and cannabis plants in 150 greenhouses. The plants will be processed into oils and sold as pharma-grade ingredients to international producers of cannabis medicine for stress, anxiety and sleep disorders. "Colombia´s favourable climate and labour costs allow us to grow premium quality, sun grown hemp and cannabis at a fraction of the cost in North America," says FoliuMed´s Colombian CEO Diego Felipe Navarro. "Our cultivation and manufacturing processes have been designed by our partner Taproot Holdings, a US licenced cannabis producer, and adhere to the most stringent international quality requirements." FoliuMed´s cultivation team, led by renown US grow manager Mark Ziegler, recently registered over 70 trademark protected strains for a first harvest in 2019. "We believe that our cultivation site offers one of the more favourable grow conditions in the world, and are ready to scale up if demand meets our expectations," says Ziegler. Market research firm Brightfield expects the market for non-psychoactive cannabis (CBD) to grow to 22 billion USD by 2022, about 40 times its current size as companies like Coca-Cola, Constellation Brands or tobacco giant Altria are getting involved. "With the approval of the 2018 Farm Bill, we now can freely export our hemp oils made to US and European specifications at a highly competitive price point", says Navarro. Beyond the USA, FoliuMed is targeting Germany, the largest legal medicinal cannabis import market in the world, as well as Brazil. Both countries currently import high priced cannabis from Canada which Navarro believes will be unsustainable. "In Germany, cannabis medicine is fully reimbursed by the public health system which already is under heavy pressure. And in Brazil, few people can afford to pay 100 USD for a bottle of hemp oil when they can buy a gram of cannabis locally for less than a dollar¨. With such buoyant expectations for growth, FoliuMed is evaluating options to finance its growth. "All funds to date have been provided by our founders, but we are now coming to a point where we want to accelerate our development by bringing in a strategic or financial partner, "says Navarro. "We will invest about 10 M USD into our operations in several stages, and are receiving strong interest from domestic and international partners." FoliuMed (www.foliumed.com ) is an international cannabis company with cultivation, production and distribution assets in Latin America and Western Europe. Its main facility in Colombia consists of a 40-acre cultivation and extraction site in close proximity to Bogota, with an annual production capacity of 77 tons of dried cannabis and hemp flowers and 12 tons of pharma-grade oils. FoliuMed has a strategic alliance with US cannabis producer Taproot Holdings to enter the USA, the world´s largest CBD market. Taproot (www.taproot-holdings.com) is a vertically integrated craft cannabis manufacturer operating from a GMP-ready facility in North Las Vegas. Its "Roots" Vape pen brand recently won the No.1 bestselling product award on Leaflink, a B2B platform connecting 2500 retailers in the USA with over 700 brands in 12 states. Taproot holds 7 dispensary licences which it will develop throughout the State of Nevada during the course of 2019. Spring Capital (www.springcapital.eu ) is a boutique investment firm specialized in international gaming and cannabis operations in regulated markets with offices in Europe, Latam and the USA.